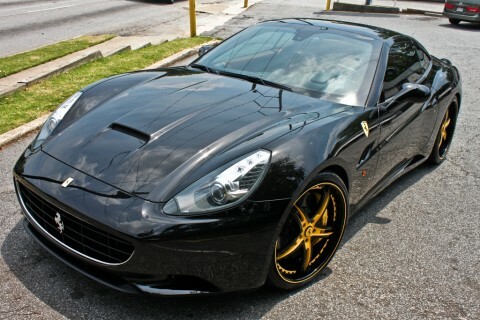 Young Jeezy has a blacked out 2011 Ferrari California. Young Jeezy accomodates the yellow calipers and yellow ferrari badges, he threw on some black and yellow Savini wheels. All of the customization was done at Car Tunes in Atlanta. I like the idea with going yellow on the wheels but this is way too much yellow going on with the register painted yellow, the center painted yellow, and a thin yellow pinstripe on the lip. And if your going to smoke the tail lights, smoke them all the way! Check out Young Jeezy’s Lamborghini here. Here is Young Jeezy’s white Lamborghini Murcielago with staggered 20″ custom painted wheels. The wheels have a white and red center with a red lip. The lips are staggered with a 3″ lip in the front and a 6″ lip in the back. As you can tell from the 2nd picture, the car was wrecked in a car accident he got into with a taxi cab. But it was still a really good choice on the wheels and the car looks looked great.